Please enter the health information required for each child attending Park no later than July 1, 2018. Log in using your Veracross username and password. 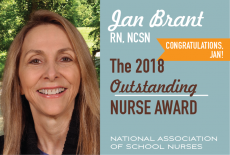 Congratulations to school nurse Jan Brant! Park's school nurse Jan Brant is the recipient of the 2018 Outstanding Private/Parochial School Nurse Award! The purpose of Health Services is to maintain, improve, and promote the health of the school age child. The school employs a Nationally Certified School Nurse (NCSN), Jan Brant, who is available in the Health Suite Monday – Friday, 8:15 a.m. to 3:30 p.m. Parents should feel free to contact the school nurse regarding health concerns of their children. Park hosts all student medical information on an online database called Magnus Health Student Medical Record. There are many benefits to this system, including less paperwork for parents to complete each year, and having more accurate information that is accessible to parents and the appropriate employees at our school. In preparation for the 2018–2019 school year, we ask that you enter the health information required for each child attending Park no later than July 1, 2018. To access your Magnus Health Account, CLICK HERE. Log in using your Veracross username and password. Some health data will be collected in Magnus Health via web-based forms that you can fill out online. Other forms require a physician to be completed; you may upload the completed forms to your child’s record using the Magnus Health Portal. If you require assistance with the Magnus Health Portal, please contact portals@parkschool.net. A fresh cold. Colds can be contagious for at least 48 hours. Returning to school too soon may slow the recovery process and expose others unnecessarily to illness. Head lice that has not been treated. Fever greater than 100 degrees Fahrenheit. Keep your child home until his or her fever has been gone for 24 hours without analgesic medication. A child with vomiting or diarrhea. He/she should be symptom free for 24 hours before returning to school. Infections/rashes on the skin that have not been diagnosed. Pink eye/conjunctivitis- child can return when prescribed eye drops are used for 24 hours and eye does not have discharge, and is not irritated/itchy. Wheezing which persists after the use of inhaler/nebulizer. Excessive tiredness or lack of an appetite. Headache, body aches, ear ache. Sore throat – a minor sore throat is usually not a problem, but a severe sore throat could be strep throat even if there is no fever. Other symptoms of strep throat in children are headache and stomach upset. Contact your pediatrician as your child needs a special test to determine if it is strep throat. Strep throat – child must remain home until 24 hours of antibiotic has been given, and the child feels well. Notify the nurse if your child develops a communicable disease or condition (for example: flu, strep throat, pink eye, head lice, impetigo). If your child has a serious illness or injury, or hospitalization notify the nurse. A doctor’s clearance is required to resume participation in athletics. Students who need crutches must have a note from the physician indicating the nature of the injury, the need for the use of crutches while at school, and the estimated length of use. Children who become ill at school and need to go home are required to be picked up by parent or other designated person within 1 hour of a call from the nurse. Children recover better at home. Prolonged stays in the nurses’ office expose children to germs. Have an emergency plan so that should you receive a sick call during the school day your child can be picked up in a timely manner. Emergency telephone numbers should include parents and two other designated adults. Update all telephone numbers as necessary throughout the school year. When parents are away, a note or email is required for the nurse prior to their departure indicating dates of the trip and names/phone numbers of the adult in charge during the parents’ absence.